We want to empowers authors with the ability to publish their own books with a system that removes all the stress and hassle. All of our publishing optionscan include everything from editing your manuscript, total book design, ISBN, print-on-demand, fulfillment, sales and distribution. We’ve have revolutionized self publishing by providing a simple and feature-rich book publishing vehicle that gets your book in all the most important places and in the hands of readers. We offer the greatest exposure and reach for your book by offering all three of the important book publishing formats: Print, eBook, and Audio. How do you envision your book publishing experience? Perhaps you see your non-fiction book on the market as a Trade Paperback with a CD in the book. Or perhaps your Fiction Book published as a trade paperback and Poetry book as an eBook or Children’s Book in Audio Book format. Just as self publishing provides many possibilities, our publishing method provides an experience that caters to you. Your book, truly published your way. 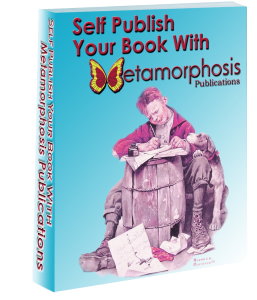 Publish with Metamorphosis Publishing and you’ll keep all your rights. You’ll be in control of your content and your book publishing experience while having an established book publisher as a partner with you. Authors can enjoy great success with their books. We make it easy to publish your book today. We will take you from writer to published author and you can enjoy the exposure and satisfaction that come with publishing your book. Contact us by phone @ 404-MYCARDS (692-2737) or fill in the quote form below letting us know about your book aspirations. We will get right back with you on fulfilling your dream of becoming a published author! God bless you!